Learned helplessness is behavior that occurs when the subject endures repeatedly painful or otherwise aversive stimuli which it is unable to escape from or avoid. After such experiences, the organism often fails to learn or accept "escape" or "avoidance" in new situations where such behavior is likely to be effective. In other words, the organism learned that it is helpless. In situations where there is a presence of aversive stimuli, it has accepted that it has lost control and thus gives up trying, even as changing circumstances offer a method of relief from said stimuli. Such an organism is said to have acquired learned helplessness. Learned helplessness theory is the view that clinical depression and related mental illnesses may result from such real or perceived absence of control over the outcome of a situation. American psychologist Martin Seligman initiated research on learned helplessness in 1967 at the University of Pennsylvania as an extension of his interest in depression. This research was later expanded through experiments by Seligman and others. One of the first was an experiment by Seligman & Maier: In Part 1 of this study, three groups of dogs were placed in harnesses. Group 1 dogs were simply put in a harnesses for a period of time and were later released. Groups 2 and 3 consisted of "yoked pairs". Dogs in Group 2 were given electric shocks at random times, which the dog could end by pressing a lever. Each dog in Group 3 was paired with a Group 2 dog; whenever a Group 2 dog got a shock, its paired dog in Group 3 got a shock of the same intensity and duration, but its lever did not stop the shock. To a dog in Group 3, it seemed that the shock ended at random, because it was his paired dog in Group 2 that was causing it to stop. Thus, for Group 3 dogs, the shock was "inescapable". In a second experiment later that year with new groups of dogs, Overmier and Seligman ruled out the possibility that, instead of learned helplessness, the Group 3 dogs failed to avert in the second part of the test because they had learned some behavior that interfered with "escape". To prevent such interfering behavior, Group 3 dogs were immobilized with a paralyzing drug (curare), and underwent a procedure similar to that in Part 1 of the Seligman and Maier experiment. When tested as before in Part 2, these Group 3 dogs exhibited helplessness as before. This result serves as an indicator for the ruling out of the interference hypothesis. From these experiments, it was thought that there was to be only one cure for helplessness. In Seligman's hypothesis, the dogs do not try to escape because they expect that nothing they do will stop the shock. 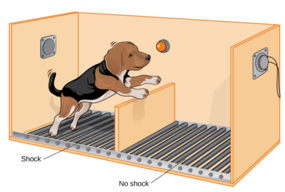 To change this expectation, experimenters physically picked up the dogs and moved their legs, replicating the actions the dogs would need to take in order to escape from the electrified grid. This had to be done at least twice before the dogs would start willfully jumping over the barrier on their own. In contrast, threats, rewards, and observed demonstrations had no effect on the "helpless" Group 3 dogs. Later experiments have served to confirm the depressive effect of feeling a lack of control over an aversive stimulus. For example, in one experiment, humans performed mental tasks in the presence of distracting noise. Those who could use a switch to turn off the noise rarely bothered to do so, yet they performed better than those who could not turn off the noise. Simply being aware of this option was enough to substantially counteract the noise effect. In 2011, an animal study found that animals with control over stressful stimuli exhibited changes in the excitability of certain neurons in the prefrontal cortex. Animals that lacked control failed to exhibit this neural effect and showed signs consistent with learned helplessness and social anxiety. Research has found that a human's reaction to feeling a lack of control differs both between individuals and between situations, i.e. learned helplessness sometimes remains specific to one situation but at other times generalizes across situations. Such variations are not explained by the original theory of learned helplessness, and an influential view is that such variations depend on an individual's attributional or explanatory style. According to this view, how someone interprets or explains adverse events affects their likelihood of acquiring learned helplessness and subsequent depression. For example, people with pessimistic explanatory style tend to see negative events as permanent ("it will never change"), personal ("it's my fault"), and pervasive ("I can't do anything correctly"), are likely to suffer from learned helplessness and depression. Such people can often be helped to learn a more realistic explanatory style by cognitive behavioral therapy, a therapy heavily endorsed by Seligman. A global attribution occurs when the individual believes that the cause of negative events is consistent across different contexts. A specific attribution occurs when the individual believes that the cause of a negative event is unique to a particular situation. A stable attribution occurs when the individual believes the cause to be consistent across time. An unstable attribution occurs when the individual thinks that the cause is specific to one point in time. while an internal attribution assigns causality to factors within the person. Research has shown that increased 5-HT (serotonin) activity in the dorsal raphe nucleus plays a critical role in learned helplessness. Other key brain regions that are involved with the expression of helpless behavior include the basolateral amygdala, central nucleus of the amygdala and bed nucleus of the stria terminalis. Activity in medial prefrontal cortex, dorsal hippocampus, septum and hypothalamus has also been observed during states of helplessness. In the article, "Exercise, Learned Helplessness, and the Stress-Resistant Brain", Benjamin N. Greenwood and Monika Fleshner discuss how exercise might prevent stress-related disorders such as anxiety and depression. They show evidence that running wheel exercise prevents learned helplessness behaviors in rats. They suggest that the amount of exercise may not be as important as simply exercising at all. The article also discusses the neurocircuitry of learned helplessness, the role of serotonin (or 5-HT), and the exercise-associated neural adaptations that may contribute to the stress-resistant brain. However, the authors finally conclude that "The underlying neurobiological mechanisms of this effect, however, remain unknown. Identifying the mechanisms by which exercise prevents learned helplessness could shed light on the complex neurobiology of depression and anxiety and potentially lead to novel strategies for the prevention of stress-related mood disorders". People who perceive events as uncontrollable show a variety of symptoms that threaten their mental and physical well-being. They experience stress, they often show disruption of emotions demonstrating passivity or aggressivity, and they can also have difficulty performing cognitive tasks such as problem-solving. They are less likely to change unhealthy patterns of behavior, causing them, for example, to neglect diet, exercise, and medical treatment. Abnormal and cognitive psychologists have found a strong correlation between depression-like symptoms and learned helplessness in laboratory animals. Young adults and middle-aged parents with a pessimistic explanatory style often suffer from depression. They tend to be poor at problem-solving and cognitive restructuring, and also tend to demonstrate poor job satisfaction and interpersonal relationships in the workplace. Those with a pessimistic style also tend to have weakened immune systems, having not only increased vulnerability to minor ailments (e.g., cold, fever) and major illness (e.g., heart attack, cancers), but also poorer recovery from health problems. Learned helplessness can be a factor in a wide range of social situations. In emotionally abusive relationships, the victim often develops learned helplessness. This occurs when the victim confronts and/or tries to leave the abuser, only to have the abuser dismiss or trivialize the victim's feelings, pretend to care but not change, and/or impede the victim from leaving. The motivational effect of learned helplessness is often seen in the classroom. Students who repeatedly fail may conclude that they are incapable of improving their performance, and this attribution keeps them from trying to succeed, which results in increased helplessness, continued failure, loss of self-esteem and other social consequences. Child abuse by neglect can be a manifestation of learned helplessness. For example, when parents believe they are incapable of stopping an infant's crying, they may simply give up trying to do anything for the child. Those who are extremely shy or anxious in social situations may become passive due to feelings of helplessness. Gotlib and Beatty (1985) found that people who cite helplessness in social settings may be viewed poorly by others, which tends to reinforce the passivity. Aging individuals may respond with helplessness to the deaths of friends and family members, the loss of jobs and income, and the development of age-related health problems. This may cause them to neglect their medical care, financial affairs, and other important needs. According to Cox et al., Abramson, Devine, and Hollon (2012), learned helplessness is a key factor in depression that is caused by inescapable prejudice (i.e., "deprejudice"). Thus: "Helplessness born in the face of inescapable prejudice matches the helplessness born in the face of inescapable shocks." According to Ruby K. Payne's book A Framework for Understanding Poverty, treatment of the poor can lead to a cycle of poverty, a culture of poverty, and generational poverty. This type of learned helplessness is passed from parents to children. People who embrace this mentality feel there is no way to escape poverty and so one must live in the moment and not plan for the future, trapping families in poverty. Social problems resulting from learned helplessness may seem unavoidable to those entrenched. However, there are various ways to reduce or prevent it. When induced in experimental settings, learned helplessness has been shown to resolve itself with the passage of time. People can be immunized against the perception that events are uncontrollable by increasing their awareness of previous experiences, when they were able to effect a desired outcome. Cognitive therapy can be used to show people that their actions do make a difference and bolster their self-esteem. Cognitive scientist and usability engineer Donald Norman used learned helplessness to explain why people blame themselves when they have a difficult time using simple objects in their environment. The US sociologist Harrison White has suggested in his book Identity and Control that the notion of learned helplessness can be extended beyond psychology into the realm of social action. When a culture or political identity fails to achieve desired goals, perceptions of collective ability suffer. In CIA interrogation manuals learned helplessness is characterized as "apathy" which may result from prolonged use of coercive techniques which result in a "debility-dependency-dread" state in the subject, "If the debility-dependency-dread state is unduly prolonged, however, the arrestee may sink into a defensive apathy from which it is hard to arouse him." ^ Carlson, Neil R. (2010). Psychology the science of behavior. Pearson Canada. p. 409. ISBN 978-0-205-69918-6. ^ Nolen, J.L. "Learned helplessness". Encyclopædia Britannica. Retrieved 14 January 2014. ^ Seligman, M. E. P. (1975). Helplessness: On Depression, Development, and Death. San Francisco: W. H. Freeman. ISBN 978-0-7167-2328-8. ^ a b c Seligman, M. E. P. (1972). "Learned helplessness". Annual Review of Medicine. 23 (1): 407–412. doi:10.1146/annurev.me.23.020172.002203. ^ a b Hiroto, D.S. ; Seligman, M.E.P. (1975). "Generality of learned helplessness in man". Journal of Personality and Social Psychology. 31 (2): 311–27. doi:10.1037/h0076270. ^ Peterson, C.; Park, C. (1998). "Learned helplessness and explanatory style". In Barone, D. F.; Hersen, M.; VanHasselt, V. B. (eds.). Advanced Personality. New York: Plenum Press. pp. 287–308. ISBN 978-0-306-45745-6. ^ Cole, C. S.; Coyne, J. C. (1977). "Situational specificity of laboratory-induced learned helplessness in humans". Journal of Abnormal Psychology. 86 (6): 615–623. doi:10.1037/0021-843X.86.6.615. ^ Peterson, C.; Seligman, M.E.P. (1984). "Causal explanations as a risk factor for depression: Theory and evidence". Psychological Review. 91 (3): 347–74. doi:10.1037/0033-295x.91.3.347. ^ a b Abramson, L. Y.; Seligman, M. E. P.; Teasdale, J. D. (1978). "Learned helplessness in humans: Critique and reformulation". Journal of Abnormal Psychology. 87 (1): 49–74. doi:10.1037/0021-843X.87.1.49. PMID 649856. ^ Peterson, C.; Maier, S. F.; Seligman, M. E. P. (1995). Learned Helplessness: A Theory for the Age of Personal Control. New York: Oxford University Press. ISBN 978-0-19-504467-6. ^ Weiner, B. (1986). An attributional theory of motivation and emotion. New York: Springer-Verlag. ^ Hammack, Sayamwong; Cooper, Matthew; Lezak, Kimberly (2012). "Overlapping neurobiology of learned helplessness and conditioned defeat: Implications for PTSD and mood disorders". Original Paper. University of Vermont. 62 (2): 565–575. doi:10.1016/j.neuropharm.2011.02.024. PMC 3433056. PMID 21396383. ^ Greenwood, Benjamin (2008). "Excerise, Learned Helplessness, and the Stress-Resistant Brain" (PDF). Original Paper. University of Colorado-Boulder and Department of Integrative Physiology. 10 (2): 81–98. doi:10.1007/s12017-008-8029-y. PMID 18300002. Retrieved 2 November 2012. ^ Roth, S. (1980). "A revised model of learned helplessness in humans". Journal of Personality. 48: 103–33. doi:10.1111/j.1467-6494.1980.tb00969.x. ^ Wortman, C.B. & Brehm, J.W. (1975). Response to uncontrollable outcomes: An integration of reactance theory and the learned helplessness model. In Advances in experimental social psychology, L. Berkowitz, (ed.). Vol. 8. New York: Academic Press. ^ Sullivan, D.R. ; Liu, X; Corwin, D.S. (2012). "Learned Helplessness Among Families and Surrogate Decision-makers of Patients Admitted to Medical, Surgical and Trauma Intensive Care Units". Chest. 142 (6): 1440–1446. doi:10.1378/chest.12-0112. PMC 3515025. PMID 22661454. ^ a b Henry, P.C. (2005). "Life stress, explanatory style, hopelessness, and occupational stress". International Journal of Stress Management. 12 (3): 241–56. doi:10.1037/1072-5245.12.3.241. ^ Jones, Ishmael (2008, revised 2010). The Human Factor: Inside the CIA's Dysfunctional Intelligence Culture. New York: Encounter Books. ISBN 978-1-59403-223-3. ^ Maier S.F. ; Watkins, L.R. (2005). "Stressor controllability and learned helplessness: The roles of the dorsal raphe nucleus, serotonin, and corticotropin-releasing factor" (PDF). uvm.edu. ^ Chang, E.C. ; Sanna, L.J. (2007). "Affectivity and psychological adjustment across two adult generations: Does pessimistic explanatory style still matter?". Personality and Individual Differences. 43 (5): 1149–59. doi:10.1016/j.paid.2007.03.007. ^ Welbourne, J.L. ; Eggerth, D.; Hartley, T.A. ; Andrew, M.E. ; Sanchez, F. (2007). "Coping strategies in the workplace: Relationships with attributional style and job satisfaction". Journal of Vocational Behavior. 70 (2): 312–25. doi:10.1016/j.jvb.2006.10.006. ^ Bennett, K.K. ; Elliott, M. (2005). "Pessimistic explanatory style and Cardiac Health: What is the relation and the mechanism that links them?". Basic and Applied Social Psychology. 27 (3): 239–48. doi:10.1207/s15324834basp2703_5. ^ Stipek, D.E.P. (1988). Motivation to learning. Allyn & Bacon: Boston. ^ Ramirez, E.; Maldonado, A.; Martos, R. (1992). "Attribution modulate immunization against learned helplessness in humans". Journal of Personality and Social Psychology. 62: 139–46. doi:10.1037/0022-3514.62.1.139. ^ Donovan, W.L. ; Leavitt, L.A.; Walsh, R.O. (1990). "Maternal self-efficacy: Illusory control and its effect on susceptibility to learned helplessness". Child Development. 61 (5): 1638–47. doi:10.2307/1130771. JSTOR 1130771. ^ Rodin, J. (1986). "Aging and health: Effects of the sense of control". Science. 233 (4770): 1271–6. doi:10.1126/science.3749877. ^ Cox, William (2012). "Stereotypes, Prejudice, and Depression The Integrated Perspective" (PDF). Original Paper. 7 (5): 427–449. doi:10.1177/1745691612455204. Retrieved 16 November 2012. ^ Payne, Ruby K. Framework for understanding poverty. Highlands, Tex: Aha! Process, 2005. ^ Young, L.D. ; Allin, J.M. (1986). "Persistence of learned helplessness in humans". Journal of General Psychology. 113: 81–8. doi:10.1080/00221309.1986.9710544. ^ Altmaier, E.M.; Happ, D.A. (1985). "Coping skills training's immunization effects against learned helplessness". Journal of Social and Clinical Psychology. 3 (2): 181–9. doi:10.1521/jscp.1985.3.2.181. ^ Thornton, J.W. ; Powell, G.D. (1974). "Immunization to and alleviation of learned helplessness in man". American Journal of Psychology. 87 (3): 351–67. doi:10.2307/1421378. JSTOR 1421378. ^ Orbach, E.; Hadas, Z. (1982). "The elimination of learned helplessness deficits as a function of induced self-esteem". Journal of Research in Personality. 16 (4): 511–23. doi:10.1016/0092-6566(82)90009-5. ^ Norman, Donald (1988). The Design of Everyday Things. New York: Basic Books. pp. 41–42. ISBN 978-0-465-06710-7. ^ "KUBARK COUNTERINTELLIGENCE INTERROGATION". CIA. July 1963. pp. Chapter IX. Coercive Counterintelligence Interrogation of Resistant Sources. Archived from the original on 2 June 2006. Retrieved 11 December 2014. If the debility-dependency-dread state is unduly prolonged, however, the arrestee may sink into a defensive apathy from which it is hard to arouse him. ^ Benedict Carey (10 December 2014). "Architects of C.I.A. Interrogation Drew on Psychology to Induce 'Helplessness'". The New York Times. The Times Company. Retrieved 11 December 2014. An in-depth discussion of "Learned Helplessness" with helpful charts and graphs at University of Plymouth's "Study and Learning Materials On-line"
Whitson, Jennifer A.; Galinsky, Adam D. (2008). "Lacking Control Increases Illusory Pattern Perception". Science. 322 (5898): 115–17. doi:10.1126/science.1159845. PMID 18832647.